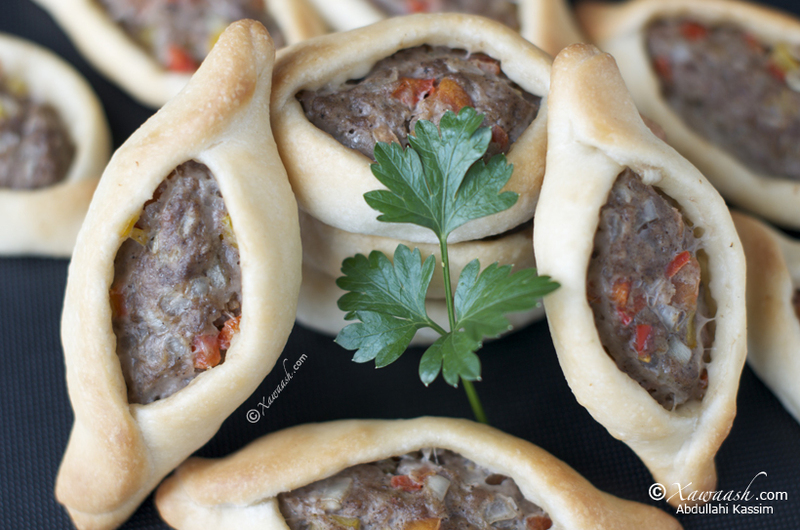 For Middle Eastern recipes, we owe a lot to Jeddah where we lived for several years. With so many expatriate friends as well as all the different types of restaurants, it was very easy to fall in love with Middle Eastern cooking. Leila was not working at the time (just like most of the women) and she had plenty of time on her hands. So she, together with her neighbours, established a routine where, on a rotating basis, one of them would host the other ladies for coffee and snacks. It was a great way to socialize, exchange recipes, and of course engage in a little gossip. We will share with you all those amazing recipes but you will not be privy to the gossip. It is sealed and concealed. One of those neighbours was Um Ayman whose recipes we adored. She was from Syria and was a very talented cook who had a large repertoire of traditional Syrian recipes. 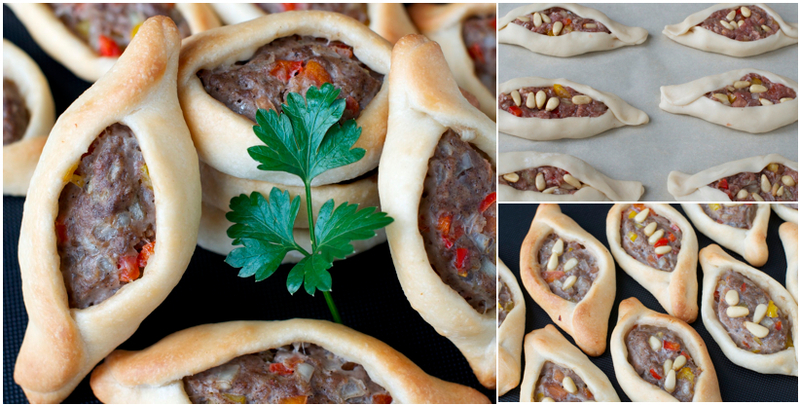 This fatayer recipe is from the wonderful Um Ayman and we hope that you will agree that they are truly delectable. This post is a tribute to Um Ayman. On these difficult days for Syria, we hope that she, as well as her loved ones, are safe and are not in harm’s way. We also wish peace, justice, and prosperity for all the people of Syria. Pour les recettes du Moyen Orient, nous devons beaucoup à Jeddah où nous avons vécu plusieurs années. Avec la présence de beaucoup d’amis expatriés ainsi que de toutes sortes de restaurants, il était très facile de tomber amoureux de la cuisine du Moyen Orient. Leila ne travaillait pas à ce moment là (comme la plupart des femmes) et elle avait beaucoup de temps libre. Donc elle, avec ses voisines, avait une routine où chacune leur tour, l’une d’elles recevait les autres pour le café et une collation. C’était un très bon moyen de rencontrer des gens, d’échanger des recettes, et bien sûr de partager nouvelles et ragots. Nous vous dévoilerons toutes ces excellentes recettes mais vous ne saurez rien des ragots. C’est top secret. Une des ces voisines était Um Ayman dont nous adorions les recettes. Elle venait de Syrie et elle était une cuisinière talentueuse qui avait un grand répertoire de recettes traditionnelles syriennes. 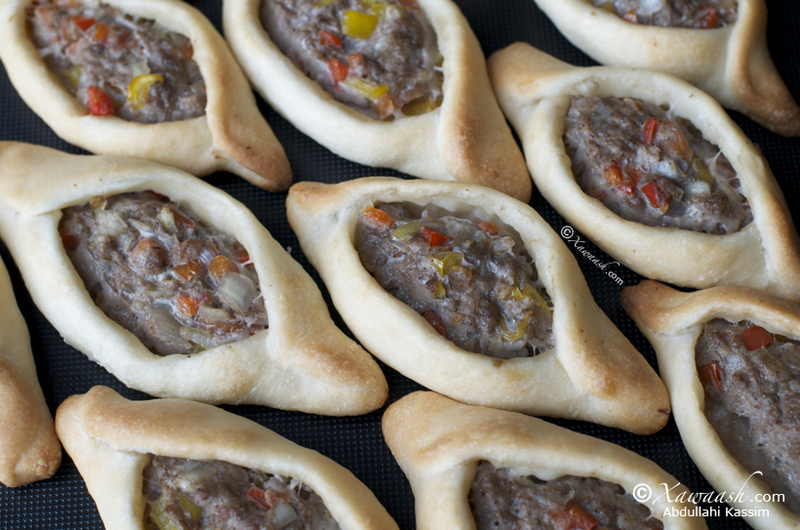 Cette recette du fatayer nous vient de la merveilleuse Um Ayman et nous espérons que vous décrouvrirez aussi qu’elle est vraiment délicieuse. Ce post est un hommage à Um Ayman. En ces temps difficiles pour la Syrie, nous espérons qu’elle, ainsi que ses proches, sont sains et saufs. Nous souhaitons paix, justice et prospérité à tout le peuple de Syrie. 1. Place the flour in the bowl. 2. 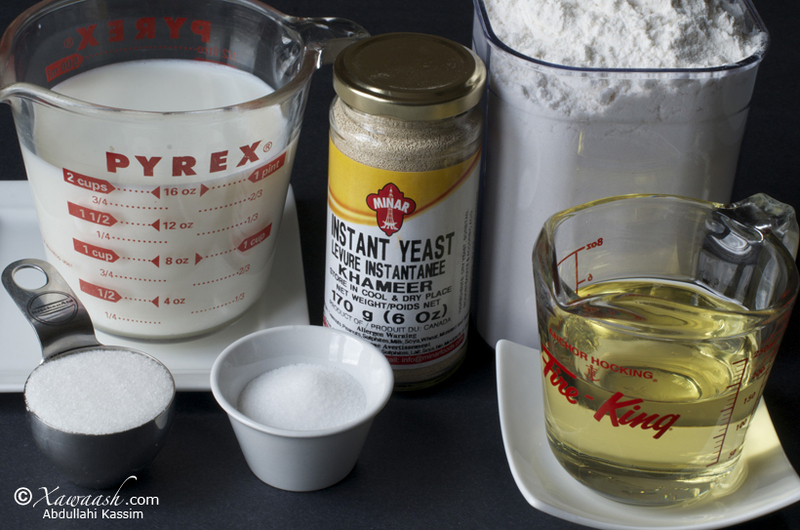 Add the instant dry yeast. 3. Add the salt. 4. Add the sugar. 5. Add the warm milk. 6. 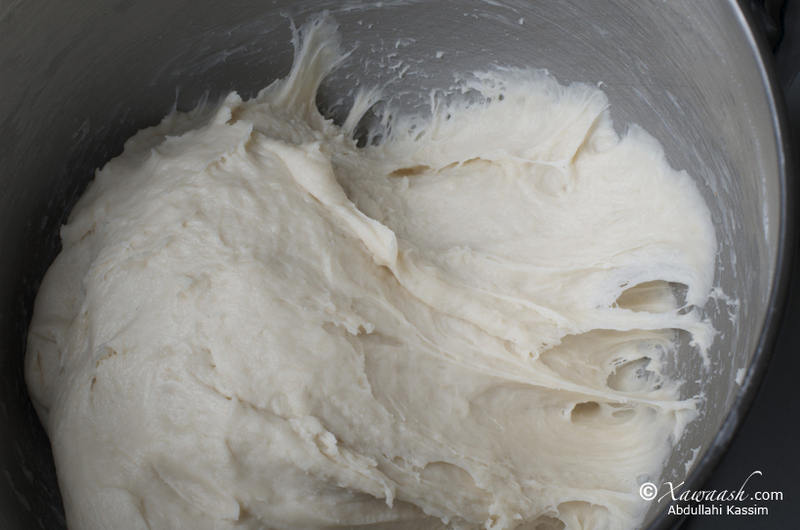 Add the oil and mix for 4 minutes with a stand mixer or mix and knead for 10 minutes by hand. 1. Burka baaquliga ku-shub. 2. Qamiirka rootiga ku-dar. 3. Cusbada ku-dar. 4. Sokorta ku-dar. 5. Caanha qandaca ah ku-dar. 6. Saliidda ku-dar. Afar daqiiqo makiinad ku-rifaaq ama 10 daqiiqo gacan ku-rifaaq. 1. Verser la farine dans un plat. 2. Ajouter la levure chimique. 3. Verser le sel. 4. Verser le sucre 5. Verser le lait tiède. 6. Ajouter l’huile et mélanger 4 minutes avec un mixeur ou mélanger et pétrir 10 minutes à la main. 1. Place the diced onions in a bowl. 2. Add the allspice. 3. Add the salt then mix. 4. Add the olive oil and mix well. 5. 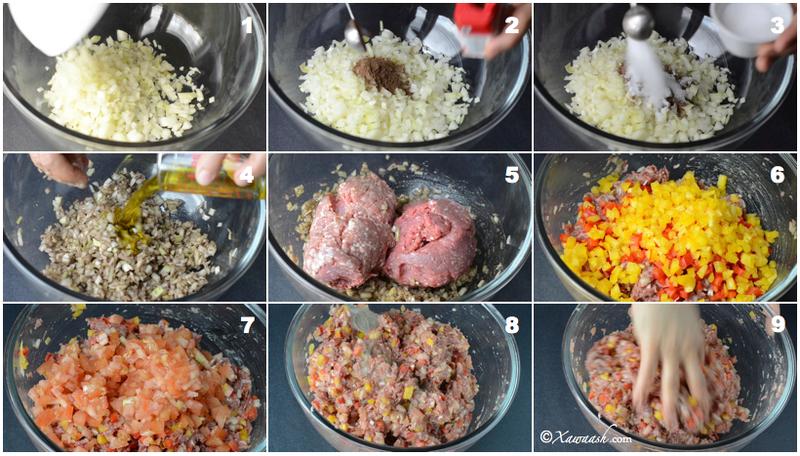 Add the ground beef and lamb, then mix well. 6. 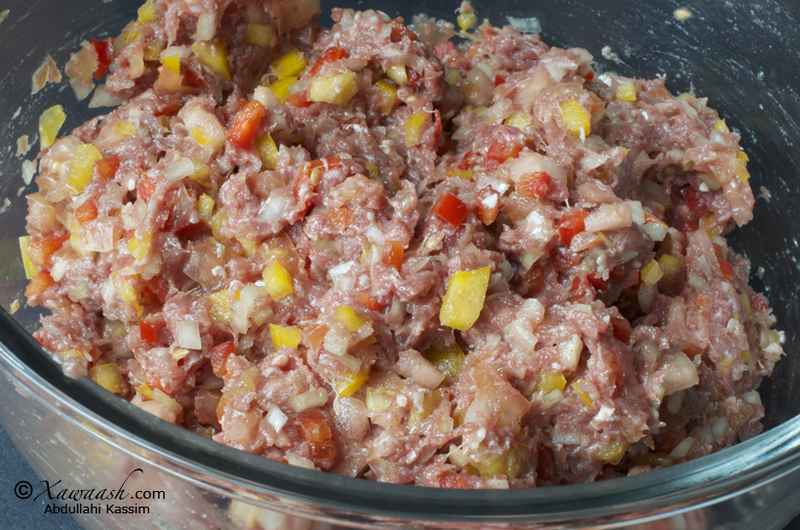 Add the diced red and yellow peppers. 7. 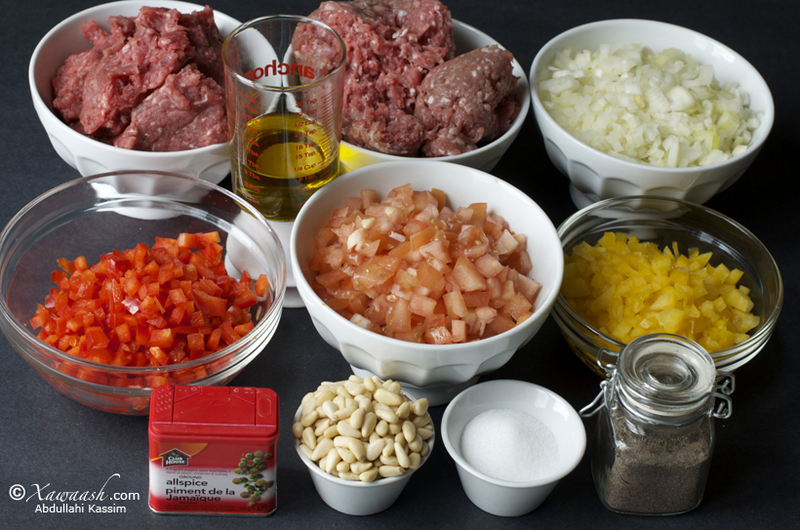 Add the diced tomatoes. 8. Add the ground black pepper. 9. Mix well. 1. Basasha baaquli ku-shub. 2. Ku-dar buhaarka “allspice”. 3. Cusbada ku-dar. 4. Saliidda ku-dar. 5. Hilibka shiidan (lo’da iyo ariga) ku-dar. 6. Barbarooniga gaduudka iyo jaalada ku-dar. 7. Yaanyada jarjaran ku-dar. 8. Filfisha madoow ku-dar. 9. Si-fiican isku-qas. 1. Mettre l’oignon émincé en dés dans un plat. 2. Ajouter le quatre-épices. 3. Ajouter le sel et mélanger. 4. Ajouter l’huile d’olive et bien mélanger. 5. Ajouter le boeuf et l’agneau hachés, bien mélanger. 6. Ajouter les poivron rouge et jaune taillés en dés. 7. Ajouter la tomate taillée en dés. 8. Ajouter le poivre noir moulu. 9. Bien mélanger. 1. 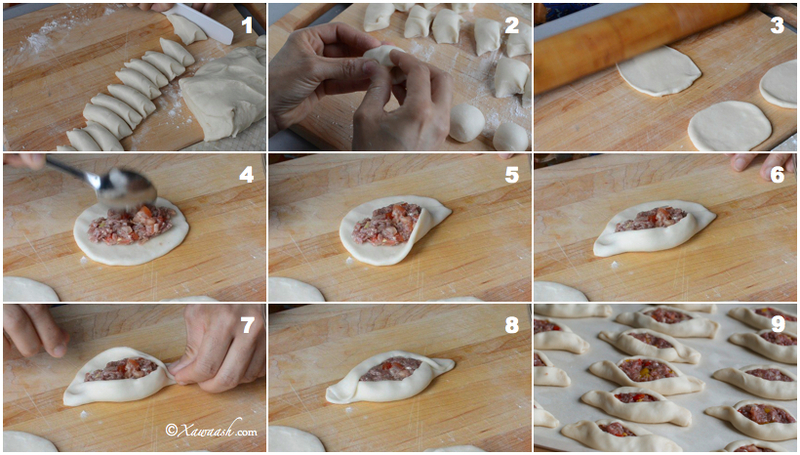 Divide the dough into 50 equal pieces. 2. Shape each piece into a ball (about 1½ inch ball). 3. 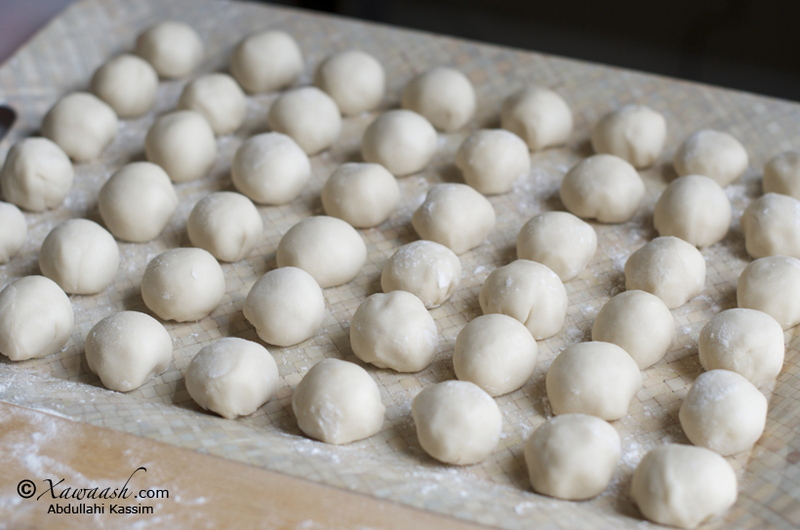 Spread each ball using your fingertips, or rolling pin, or pasta roller. 4. Place 1 Tbsp of filling on the dough. 5. Lift a corner and pinch it down as shown in the picture. 6. Lift and pinch down the other corner. 7. Repeat on the other side. 8. This is what the fatayer should look like. 9. Place on an oiled baking sheet or cover the sheet with parchment paper. Bake at 400°F/204°C for 14 to 16 minutes. 1. Burka 50 gabal is-le’eg u-qaybi. 2. Gabal walba kuuskuus sida sawirka. 3. Burka fidi. Waxaad isticmaali kartaa farahaada, ama qoriga lagu fidiyo, ama makiinadda baastada. 4. Hal QW oo hilib ah saar burka. 5. Dhinac soo qaad oo soo laab kuna dheji sida sawirka. 6. Dhinaca kalena sidoo kale u-soo laab oo isku dheji. 7. Labada dhinac oo kalena sidoo kale u-sameey. 8. Fataa’irka sidaas ayay u ekaanaayaan. 9. Waxaa saartaa bir aad saliid marisay ama isticmaal xaanshi “parchment”. Ku-dub foorno kulaylkeeda yahay 400°F/204°C, muddo 14 ilaa 16 daqiiqo. 1. Diviser la pâte en 50 parts égales. 2. Rouler chaque morceau en boule (de + ou – 4 cm). 3. Etaler chaque boule avec les doigts, ou un rouleau à patisserie, ou une machine à pâtes. 4. Déposer une cuillère à soupe de farce au centre de la pâte. Déposer quelques pignons et presser pour qu’ils ne tombent pas. 5. Relever un côté de la pâte, le plier et le pincer à l’extrémité comme sur la photo. 6. Relever et pincer l’autre extrémité. 7. Répéter avec l’autre côté de la pâte. 8. Voici à quoi ressemble le fatayer (chausson). 9. Placer les chaussons sur une plaque de cuisson huilée ou recouverte de papier cuisson. Cuire à 400°F/200°C pendant 14 à 16 minutes. mida kale cheese laguma dari karo miyaa ? if so sideen ugu daraa ? Watching this on an empty stomach is torture!!!!!! Can’t wait to give it a try, I love meatpies! 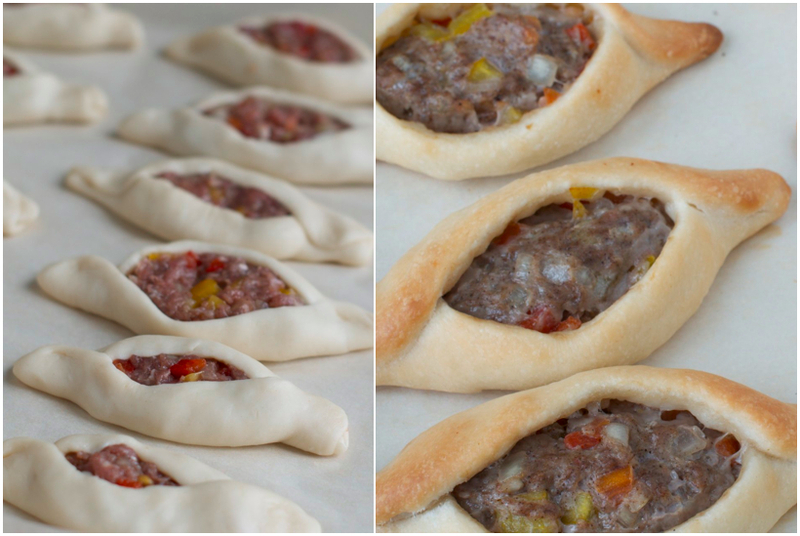 They are easy to make and they taste delicious! I’m sure they do! I’m finally back in Canada and I have newlyweds over for iftaar on Friday. I wanted to make these but since it’ll be my first time making them I was thinking to do them tomorrow (Thursday) and freezing them as per the suggestion at the end. Are they as great once defrosted or is it better to take a leap of faith and have them done on Friday? 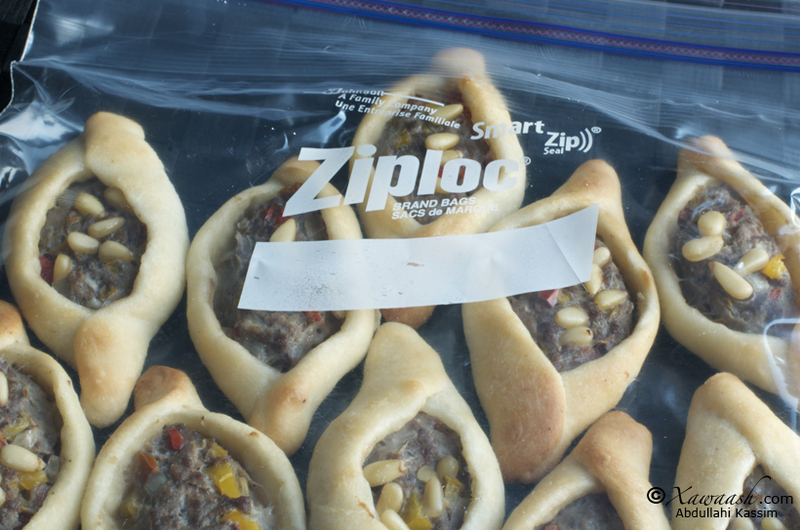 It is better to make them on Thursday and since you will be using them the next day there is no need to freeze them. You can keep them in the fridge. They stay us good once defrosted. We have them in the freezer when we need we just put them in the toaster, and they are still amazing. Thank you for the question. sugada oo la kariyay laguma dari karo miyaa ? Waxaad jeceshahay ayaad ku-dari kartaa, laakiin sidaan ayuu ku-fiican yahay. From the limited German that we know and a little help from Google , this is what we understood from the comment. I am German and I am a retired chef. I live in Mombasa. Your recipes that I’ve seen so far are all excellent. I also tried a few and have to say, “VERY GOOD.” Thank you very much. Thanks to you, dear friend. Schönen Dank. cant wait for ramadan guys, i smelled ramadan already thank you a&l. looking forward to more recipes. I love your site and I can’t wait to try this recipe. Thanks to you my family will have an amazing ramadaan. Your site has become referrence point for all things “somali food”. THANK YOU THANK YOU THANK YOU!!! Waa ku-mahadsan tahay faalladaada iyo ducada. Asaga oo duban ayaa barafka gelinaysaa. Burka markaad qasto intaad hilibka diyaarinaysid ayaa ku-filan inuu oolaado. Mahadsanid walaal. Waxaad ka-heli kartaa amazon.com. Assalamu Alaikum do you let the dough rest and rise for how long? Love your blog I check for new recipes every couple days to see if you guys post new recipes. You can let it rest for 10 minutes. 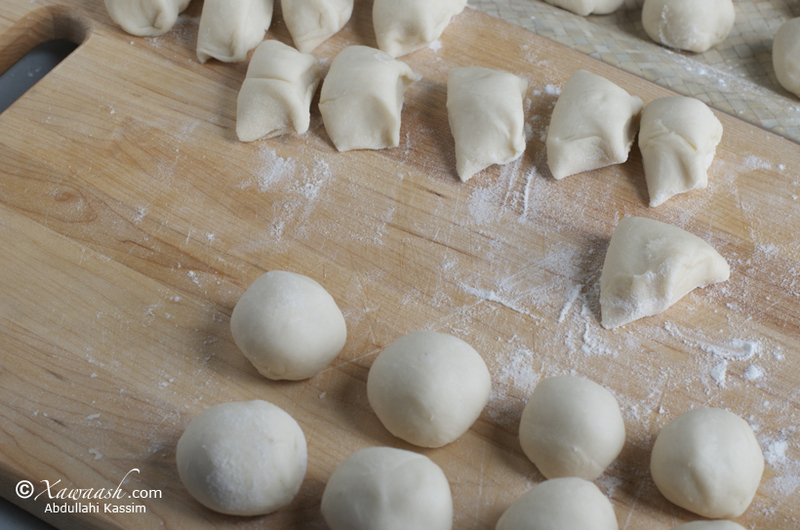 By the time you prepare the filling, the dough will be ready to work with. Mahadsanid walaal Asho. 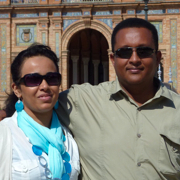 Adigana qeyr aan dhammaan ayaan kuu rajeynaynaa. Asc wr wb? Maashaa Allaah tabaarakallah. Wa jacalal Firdowsal Aclaa ma’waakum. Aamiin. Aad ayaad u-mahadsan tahay. Ilaahey waxaan kaaga baryeynaa inuu ku-siiyo intaad noogu ducaysay ka-badan. Aamiin. Do you add the pine nuts before or after the baking? We added the pine nuts before baking. Make sure you press them down so they will not fall off. Mahadsanid walaal. Ducadaada Allaha inoo aqbalo. Adigana qeyr ayaan kuu rajeynaynaa. Hadduu Eeebbe idmo, malawax iyo cambuulo waan soo gelin doonnaa. Waxaan ku tala jirnaa inaan malawaxa soo gelinno Ramadaanka ka-hor, Insha’Allaah. Thank you very much, for your giving us this chance which we are learning as a university, and gaining a lot of benefits, I myself study every day a new topic, which I practice and I suceeded many things included this Fataa’ir,it is really very delicious and easy to cook. s.c walaalaay aad&aad ayaad u mahadasantihiin ilaahay ajar &xasanaad ha idiinkuku badalo qeer badan iyo caafimaad ayaan idiin rajeynaa. Ducadaada Illaahay ha inoo aqbalo. Adiga iyo dhammaan beesha Xawaash waxaan idiin rajeynaynaa qeyr aan dhammaanin. Aamiin. You guys are amazing! (but you probably already know that) This website really makes me proud to be Somali. With all the wonderful recipes, professional photos, and great videos. If you haven’t already considered, please try opening a resturant. Your food looks mouth watering, and this kind of stuff should be out there for the public. Maybe you guys can even try opening a place in Xamar. Lots of people are opening up businesses, resturants, hotels, etc. You guys should too. Thank you for making these recipes, and sharing our wonderful food with the world. Thank you for your amazing comment. If any one had any doubts whether Somalis are appreciative of good effort or not, the comments on this blog should lay that to rest. Your encouraging comments are always appreciated. Aad ayaa u-mahadsan tahay walaasheenna qaaliga ah. Qeyr ayaan kuu rajaynaynaa. Asalamalaikum. I have a couple of questions! What if you don’t need exactly 50? What measurements do I use, or how much do I divide it by? Also, will the meat inside cook fully? The only thing I’m worried about is when I put in the oven, is that the meat won’t bake and it’ll be raw when I take it out…. Is it okay to use a non-stick pan when puting it in the oven? You can do half the recipe, divide every thing by two. We always bake these and the meat inside cooks sufficiently. Since the temperature is high (400) we would not recommend using non-stick pans. Thank you for the questions. Waan ku-faraxsannahay inaad jeclaatay mashmashka, waanna ku-mahadsan tahay inaad noo soo sheegtay. Waxaan rajaynaynaa Ramadaan barakaysan inuu Ilaahey inooga dhigo. This is truly amazing!!!!!! I will make sure to cook this early tomorrow for my family. I’m not the best Somali cook…but I can learn something from this site. Thank you for visiting and leaving a comment. We are happy to know that you like the website. Enjoy the fatayer. Hadduu Ilaahey yiraahdo waxaan ku-dadaalaynaa Ciidda ka-hor inaan soo gelino. Mahadsanid. Alsalaam alaikum!!! My husband is Somali, and I found my way to his heart through his stomach!!!! I have been on vacation for a while and was trying to think of a good way to surprise him and the family when I get home. I know how to make the basics, suqaar, foul, somali rice, goat, lamb, spaghetti, etc, but I dont know many quick recipes for the in between meal times. This website provides a lot of insight and I love the step by step instructions with pictures for reference. I am a cook by sight, so it helps a lot!!! THANK YOU!!! Thank you very much for your kind compliment. We are happy we could help you make your family happy. Our best wishes to you and your family. Thanks so much for the recipe, I’ll definitely be making more inshallah. Thank you so much for sharing your experience and the photo with us. We are happy you like them. Aad iyo aad ayaa ugu mahadsan tahay faalladaan aadka u-fiican, hadalada wacan iyo ducada. Markaan wax cusub samayno waxaan horta soo gelinaa goobta Xawaash kaddib ayaan video-ha Youtube-ka gelinaa. Mashallah Jazallahkhair walaal Truly wonderful recipes!! Keep it up! Thank you very much for your confidence in our recipes. No, it doesn’t taste like bur. It tastes great. Soo’da nuskeeda ayaa samayn kartaa. Wax walba laba u-qaybi. Tusaale ahaan burka wuxuu noqonaayaa laba koob iyo bar, caanaha hal koob, qamiirka qaaddada weyn nuskeeda, hilibka aad dhexda ka-gelinaysidna sidoo kale. Wax walba nuskiisa ayaad isticmaal. Intaas waxaa kaaga soo baxaysa 25 xabbo. Haddeey haraan barafka ayaad gelin kartaa, markaad u-baahato toostarka ama foornada ku-kululeey. They are really delicious. Thanks. waaaaaaaaaw masha allah . . plz can u tell me from where can I get all spices ? Thank you very much. It is available at the supermarkets. Adigaa mahadda mudan walaal. Waxaa ka heli kartaa dukaamada maacuunta lagu gado, ama dukaamada waaweyn (department store), ama internetka. how long does dough have to sit ??? ?